Emma Spickard and Ritika Jain model citizenship acts to challenge poverty according to their own spheres of influence, skills, and passions. Ritika Jain (bioengineering) and Emma Spickard (public health) have done a lot of the same things while at the University of Washington. Both matriculated as Honors students in 2015. Both have volunteered as peer mentors in Honors and are regular fixtures on the Dean’s List. Both are set to earn bachelors degrees next spring with an impressive portfolio of accomplishments under their belts. And they have both applied lessons from a recent Honors experience to the “real world” and are challenging misperceptions about poverty in our community. Both of them are still working passionately on the problem of homelessness in our culture, but how they each approach the work is different. It’s specific to their abilities, opportunities and passions. It’s aimed at the areas where they know they can make an impact. Isn’t that what engaged citizenship is all about? Last February, Emma and Ritika could be found walking door to door in Magnolia, handing out fliers and initiating uncomfortable conversations with strangers. It started as a class assignment in Honors 231: “Citizenship acts to challenge poverty.” In the interdisciplinary, experiential course, students partnered with grassroots organizations whose work “disrupts” comfortable narratives about poverty and the people who are living in Seattle without housing, organizations like Facing Homelessness, UW’s Relational Poverty Network and Real Change. Emma and Ritika both elected to help the advocacy arm of Real Change in efforts to organize a community panel including the Seattle City Office of Housing, un-housed vendors, Magnolia residents/business owners, and Catholic Community Services. 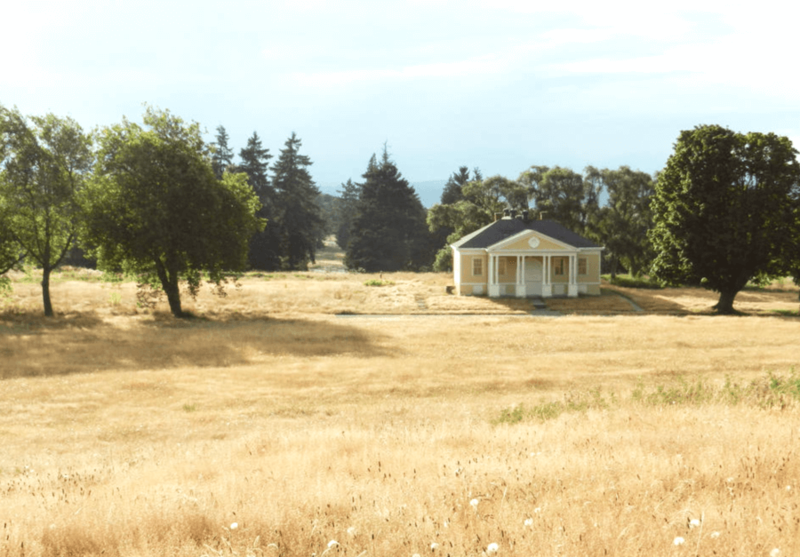 The purpose was to hold a productive civic debate on the stalled housing development at the former site of Fort Lawton at Discovery Park in Magnolia. 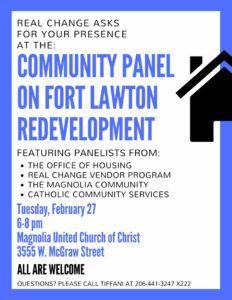 Ft. Lawton in Magnolia is city-owned land that has stood empty for a decade. Advocates say it could be home to nearly 1,000 Seattle citizens who are currently without housing. “The proposed plan would ultimately produce approximately 250 units of affordable housing,” Ritika explained, clearly disappointed by pushback and a lawsuit that has kept the land unused since its 2008 donation to the City of Seattle under the McKinney-Vento Homeless Assistance Act. A poster announcing the February panel event. “Emma and I familiarized ourselves with the concerns of residents who opposed the redevelopment plan to formulate evidence-based counterarguments that dispel common misperceptions and demonization of people experiencing homelessness,” Ritika stated. Then they went out into the community and worked to bring people into dialogue about the project. Organizers, community opponents and supporters of the development, including Real Change vendors who took part in the event, considered the event a success. More than one attendee remarked that it felt like “a real conversation” where the range of experiences reflected on the panel underscored the importance and feasibility of the proposed redevelopment. Emma Spickard with Zackary Tutwiler, August 2018. Emma remained actively connected with Real Change after the class was ended and worked this summer with her mentor, Tiffani, to promote big change at the local level. 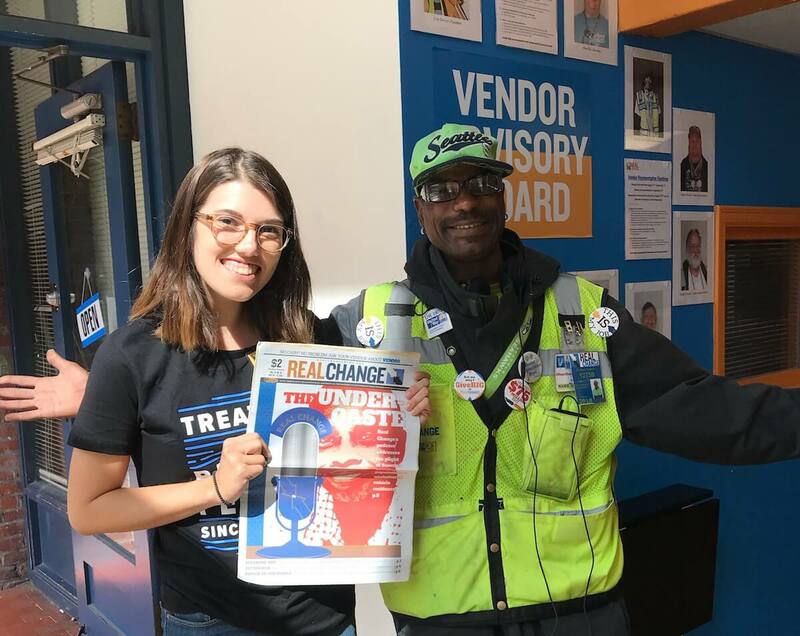 During her internship, Emma’s primary project has been to interview vendors about their experiences being unstably housed and about their expectations of Real Change. Emma says she will keep working to influence the rest of her community to have the kind of “humanizing conversations” that can make the biggest impact on this issue. “This experience has been a continuation of all that I learned from Chris [Pearson] and Vicky [Lawson]’s course and I am so stunned and grateful that what started out as a transformative class has turned into a transformative experience in the Seattle community,” Emma says. She now makes a point of initiating conversations with people she used to hurry past. Noticing the effect this was having on friends last winter, she partnered with “Citizenship Acts” classmate Chloe Sanclemente Thompson (also an Honors student and Public Health major) to create the short film “Rehumanizing Our Neighbors.” The 4-minute animated story invites students to move through the U District with greater awareness and compassion. Emma hopes to see the UW community open up to the true stories of unhoused individuals in Seattle. It starts with people like you. When we paint the picture in numbers, we start to see that homelessness isn’t a personal problem. It’s a societal problem.